Rick Monroe, owner of Monroe Marketing, was installed Monday as President of the Rotary Club of Savannah. 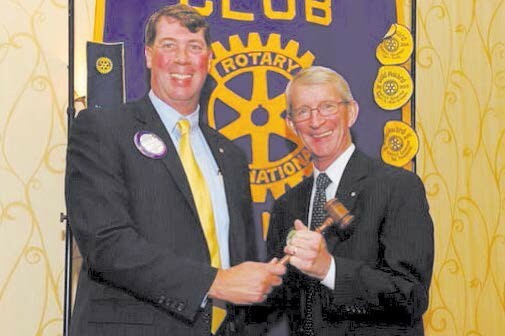 Monroe accepted the Rotary gavel from outgoing president Holden Hayes, Regional President of South State Bank. Joining Monroe in leading the club through its 102nd year in Savannah are Secretary/Treasurer Diana Morrison, Sergeant at Arms Craig Harney, and 2015-2016 Board of Directors members Rick Belford, Scott Center, Trey Cook, Eddie Culver, John Helmken, Stratton Leopold, Sam McCachern, Jamie McCurry, Chuck Powell, Cecilia Russo, and Philip Solomons, Jr.
Monroe grew up in Meridian, Mississippi and attended the University of Georgia, where he graduated with a Bachelors Degree in Journalism with a major in Advertising in 1975. He opened his marketing firm in 1988, and has been operating in Savannah for 27 years now. Monroe has volunteered for Savannah Young Life since 1975 and now acts as a member of the Young Life Committee. He also serves as an elder at Savannah Christian Church where he leads a middle school small group each week and leads a home group at the Landings. The Rotary Club of Savannah was organized Jan. 12, 1914 and has 213 members. Meetings are held most Mondays from 12:30 to 1:30 p.m., at the DeSoto Hilton Hotel, 15 E. Liberty Street.